Hello and Happy Weekend, my friends! I hope your week's been a good one! Anyway, all this planner soul-baring will have to wait for a future post - for today let me get on with the ones I'm using at the moment. And first up is a planner I'm not sure I've shown you before! Now admittedly, when I first bought this petite planner last summer, it was one of those purchases I absolutely recognized as extraneous but I simply could not help myself. It's just that pretty. The size of it intrigued me, too - but more than anything, I was completely enchanted by the gorgeous seasonally inspired pages! So I used it on and off beginning last August, but when I added a set of pastel monthly tabs to the edges I found it even more useful! To make this planner work even more efficiently, I use a coordinating binder clip to connect the front cover to the current monthly spread. Then I use a simple gold paper clip to do the same between the month-at-a-glance and the current week's spread. This makes it very easy to quickly get to the place in my planner I need to be! The last February weekly spread is split because March begins on a Thursday ... above is an example of one of the many inspiration pages found throughout the planner. Isn't the green and cream palette just perfect for March? Each month is similar, in that, the colors and illustrations match the feel of the season perfectly. And though you can hardly see it in my pictures, the planner paper (which is very smooth and lovely to write on) has a very faint quad-grid - which is SUPER helpful for those of us who appreciate a little help with keeping our handwriting straight! And then we are in April! So as you can most likely tell I am very much head-over-heels in love with this Katie Daisy planner! I would really like to use it exclusively because it feels so simply sufficient - and E-fficient - but most of all, it's so very ME. I've toyed around a little with trying to make it meet ALL my planning needs - but alas, I have an awful lot of those and it would be a rare planner indeed that would be able to accomplish that! So with that pronouncement, I turn to my next planner - my Day Designer! So this is my 2017-2018 midyear flagship Day Designer - a daily planner (with monthly calendars included) that runs from June 2017 through May 2018. I now only have a few months left to use in this planner and I can honestly say I've used just about every (daily) page! I took this picture quite early in the day so I hadn't earned too many checks! As you can see I use this page for essential information pertaining to just that one day. Things I need to remember, and do, and places I need to go. If I was paring down to only one planner, this would be a hard one to do without. It's not as portable or endearing as my Katie Daisy planner, but it is a real workhorse when it comes to the nitty-gritty details of managing my family and home every day! The very first pic at the top of this post shows you the charming divider paper I use for each month in this planner (part of this collection), and above is the back side of that sheet (left) and the March title page I created using some vintage clipart I found on Pinterest (right). When I made up this planner, I made sure to give myself PLENTY of room for monthly planning! I wanted to be able to add stickers and quotes and all kinds of information (days of note, full moons, weekly themes and ideas). And lined calendar blocks were an absolute necessity! This month I went with a Beatrix Potter theme, and used colored pencils to softy shade in the quotes. So it's different from my Katie Daisy monthly calendar in that I'm able to include much more information - and yet they both appeal to me visually. And they both make me happy! I like to start my "next week planning" on Thursdays, though I very often end up scrambling to pull it together over the weekend. Ideally if I begin my forward planning at the end of a week, that gives me the weekend to gather resources and prep materials and devote a little more attention to writing out actual lesson plans. The page on the right-hand side of this spread is for these details. Happily I'm able to coordinate many activities that will appeal to, and include, both of my younger boys - and to an extent, the whole family. My ongoing goal is to weave our seasonal homeschooling themes into as many aspects of learning and living as I can! My entire planner can be found in my printables archive, but I am working just as hard as I can - which means in fits and starts when I find time! - to make this into something I could publish and sell to interested parties. I thank you all for your patience, and will hopefully have something to share with you before too long (or at least, before the academic year begins!). In the meantime, feel free to help yourself to those free printables and let me know if you have any questions! Well, now - I'd say it's about time for me to wrap up! But I thank you, as always, for stopping by and I wish you all a very nice weekend. Thanks so much for reading and please leave me a comment if you have a moment! I can be terribly slow at responding, but please know I read (and appreciate) each and every comment! Today I'd like to talk a little about menu planning. I'm wondering when you all do it ... once a month? Once a week? On the fly? And where do you make note of your meal plans ... in a planner? On a white board? On your phone? I've been posting our dinner menus on my sidebar for a couple of months now, but you may have noticed I fell behind recently. For one thing - well, I got lazy, lol - but also, I'm trying to keep our meals rather simple throughout Lent, so it's kind of the same menus over and over again. That said, tonight our Bookworm comes home for his spring break! #happymotherdance! So I'm putting aside "simple" for savory and satisfying over the next week. I have planned a few of his favorite meals as well as a couple of new recipes I've been waiting to try when he's home. Obviously it's much easier to eat seasonally at certain times of the year than others, especially if you live in colder climates. There are strategies one can employ, of course; with careful planning and preserving and such, there are ways to stick to a seasonal schedule. I'm certainly no expert in this area, but I'm always eager to learn and do better! First up would be understanding what fruits and vegetables are available in your area and when ... and where you can get them! Visiting local farms with year-round markets is a great place to start. You can keep tabs on what's available and strike up conversations with the folks who run the market. They may have a schedule they can share with you so you'll have a rough idea of availability and can make notes on your home calendar. (Even if the farm is closed, check their website - many post seasonal calendars online.) Lots of farms these days also offer shares for the growing season - you pay a subscription for a preferred portion (family, single, etc.) and each week you take home your "share" of the farm's bounty. We've done this several times and it is SUCH a fun experience plus it's great to support local farmers. Also easy - especially if you're on Pinterest - is to just type in the search term, "seasonal eating" and up will pop many charts and references for you to work with when making your plans. Speaking of, here's a neat graphic I found in one of my old journals - aka old-school "pinning." ;) It's a handy kind of list to keep in the meal planning section of my home keeping binder. In addition to using peak produce, I like to plan meals that are in keeping with the "spirit" of the season. This is easy enough for anyone to do really - just start by asking yourself (and your family): what are meals that appeal to you in each season? Jot things down as they come to you - in a loose seasonal outline. Maybe "applesauce" in autumn, "clambakes" in summer, "strawberry-rhubarb pie" in spring and "pot roast" for a cold winter's day. That kind of thing. Now, your food lists might not resemble mine at all, because A. we may live in different parts of the world, so our growing seasons are slightly (or perhaps vastly) different, and B. seasonal eating is often tied to memory, preference and emotions, which makes it all quite personal! So there are certain foods and meals that really MAKE a season for me and my family - but they may not appeal as much - or at all - to you and yours. After you exhaust your memories, take a look around for more inspiration. There's the internet of course, but how about good old-fashioned cookbooks? And I mean that quite literally - I find older books tend to focus more on seasonal foods (fresh and preserved) because they were cheaper and plentiful and people were making things on their own more back then. (Ketchup and jam and bread and the like.) Not to mention grocers of long ago were not as diverse as ours are today. Not to say our food system is better today - it's probably not - but it is more convenient. And I know I don't have to tell you that the library is THE place to turn for cookbooks of all kinds. I do love the books I own but of course, they can be expensive! And they take up precious shelf space. I love to search my library system for cookbooks I've made note of at Barnes & Noble or books that are no longer in print ... then I can photocopy recipes I'd like to try someday. Now, I don't want you to think that every meal I prepare is completely in sync with the season! Hardly, lol. What works for us - not that it's perfect but it gets us by - is a repertoire of our usual meals (things we all like that fit our budget) and then I work in seasonal items as I can. Usually as side dishes or baked goods - banana bread in January, strawberry bread in June ... acorn squash in November, asparagus in May. And there is always an occasional "seasonal" meal, and Sunday dinners are a wonderful time to do this. Holidays and liturgical feast days are also perfect opportunities to embrace seasonal foods! I store my recipes mostly on Pinterest these days, but the ones I've clipped from a magazine or newspaper I file in seasonal folders, while precious recipe cards written by my mother or grandmother are kept in a very special box. (I'd like to do a separate post about recipe organization in the future.) When I do my weekly menu plan, I like to look at the calendar as well as my Pinterest boards. I have a board called Feeding the Family, as well as one for Seasonal Fruits & Veggies and yet another for Baking. Recently I started boards for each season and I store links for things particular to those two months. So for example, in my March & April board I have seasonal recipes for St. Patrick's Day and Lent. There's so much more to say on this subject, but for right now, here is a lovely passage from a book I'm reading this week. 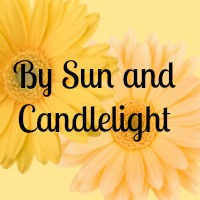 It's called A Sense of Seasons, and it was written in 1964 by Jean Hersey of Connecticut. "Every month has its satisfactions." YES! And on the previous page not shown, "Each month has its passions and plans, its idle dreams and ruminations, even its colors." Ok, I will wrap up now, I promise ... I've kept you here so very long today. Clearly this is a fun topic for me to discuss! If you have any questions or something I said needs clarification please let me know. I tend to go on (and on) and then run out of time to tighten things up! And of course, I'd love to hear your thoughts on meal planning - seasonal and otherwise! Now, most of the lasagna went back to BC with our Bookworm - but there was plenty left behind to serve as an easy lunch for the boys today. And the chicken is doing its thing in the crockpot - smells amazing! - which is quite nice. Speaking of planners, I'd like to remind you all that I am still asking for comments and emails ahead of Friday's Party - and I am so pleased that many of you have already left/sent your comments/thoughts/pics! Every submission is appreciated so much! Fall is truly a beautiful time of year - head colds and all! Good Sunday evening, my friends! I hope you've all enjoyed your weekend! It was very chilly here in New England - a taste of what's to come, I think. And boy, is our foliage turning - now that our temperatures have dropped! Well, I wanted to post this evening while I had a few minutes, to share my meal plan for next week. Tonight we are having a revised "Italian" dinner in honor of St. Francis. (Stuffed peppers will wait until our college boy is home!) We are having some potato gnocchi, simple breaded chicken, romaine salad and - rather randomly - corn on the cob, since it's been sitting in our fridge since Friday's farm pickup. I was also able to get a box of our favorite Italian cookies from a local bakery - yum! I'd love to hear what you're making this week! Anything new or maybe a favorite family dish?What do you love cooking this month? "Cooking demands attention, patience, and above all, a respect for the gifts of the earth. It is a form of worship, a way of giving thanks." This is a wonderful quote to ponder, don't you think? Especially so close to Thanksgiving! Today I am working out the final details of our holiday dinner ... talking it over with my mum, looking through my folder, writing out final lists. We usually stick to a pretty familiar meal plan but we also like to work in a few new twists. There must, of course, be roast turkey - as well as stuffing, cranberry sauce and pumpkin pie ... but we can have a little fun with apps, drinks, desserts and sides. Are you trying any new recipes this year? I thought you might like to hear what we're serving next Thursday ... and if you have a moment, I'd love to hear about your dinner plans! Which is why I have all these lists! Speaking of lists, I'm also working on my Advent plans this week because the season comes up rather quickly once Thanksgiving is over. Lots to think about, much to plan ... but I will talk more about that subject next Monday when we gather for tea. Hope you all enjoy the rest of your Thursday ... see you here again very soon! Good Monday evening, my friends ... I hope you've all had a nice day! It was a mild and muggy June day here but I still felt the urge to bake something warm and cozy! Something like ... old -fashioned bread pudding! crispy chicken legs (new recipe, sounds good! ), sweet potato puffs, steamed broccoli with lemon butter, and the rest of the leftover French bread served up as garlic toasts. Before I go, a note of sincere thanks to Rain, for helping me identify the birdsong I posted about this morning ... it appears we have a wood thrush in our midst! I have only ever seen a thrush once at our old house, so it makes me intrigued and pleased to know we have one here as well. Have a great evening, my friends ... see you here again very soon! Everything is SO green! Temps near 70 this week with mostly sunny skies, a few showery spots. Very "Spring in New England." Such a pretty time of year - lots flowering, new things to identify. And the hummingbirds have returned! Extra laundry this week. Put away winter clothes. Sort through summer clothes. Bring plants to graves on Sunday. Hang (our new!) American flag. We're nearing Little Bear's 1st birthday! The little fella is in need of a hair trim ... the hair over his ears is bugging him, though I am loathe to cut any of it! Bees - identifying (from a safe distance!) what kinds of bees visit our yard. Designing invitations for Little Bear's birthday party. Planting our own organic rhubarb! I bought this rhubarb for $10 at our village plant sale this past weekend. I am so excited to finally grow our own rhubarb! Working on my planner-binder. It's a mess, plain and simple, so I'm rethinking the whole thing. Again. Look into Wordpress as an alternative to Typepad. Well, Good Wednesday morning, my friends! Hope you all have a great day ... thanks so much for stopping by! Good Monday morning, my friends ... I hope this post finds you well! 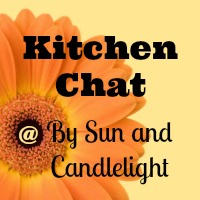 Welcome to week two of Kitchen Chat! I have a fresh pot of coffee waiting - as well as a hot pot of tea - so please pick your poison and pull up a chair. Care for a warm slice of banana bread? What are your feelings on menu planning - is it something you do (or avoid), and if so, do you enjoy it? Or does it drive you crazy, and how so? What works well for you? What confounds your menu planning? I've talked about menu planning in the past (archives here and here) but I think menu planning is one of those things that we can hash out repeatedly. I'm always looking for new ideas - trying to do it better or make it simpler and shake things up now and again. Because goodness knows, my meal plans get tiresome! So my overall feeling about menu planning is - it interests me (absorbs me, even) but it also drives me crazy because it's hard to keep on top of it. If I don't devote adequate time to menu planning, it all goes awry and then the kids are asking me what's for supper and I just have no idea. Or I'm spending way too much money on take out and/or ignoring good food in the fridge, which will soon evolve into science experiments. 2. Coordinating with our calendar as I write out the week's menus. I can see what nights somebody might be out or late coming home - what nights are better for more time-consuming meals vs. nights that demand something simple. And of course, any seasonal or holiday events that dictate a special meal. 3. Having a well-stocked pantry, fridge & freezer - for obvious reasons. This might be a topic for a whole separate post. 4. I think that's it. Websites - I love the Taste and Tell blog as well as Skinnytaste.com - they both feature really fantastic seasonal and holiday recipes. I don't do Pinterest (yet), but I have "liked" a lot of food-related pages on Facebook, and get a lot of recipe ideas in my news feed. And of course, there are my magazines - by their very nature they are great for seasonal ideas. Sunday: Irish Brunch - still working on menu! So there is my take on menu planning, my friends ... I'd love to hear yours! I think there is much more I could say, so I will probably jump into the comments when and as I can. Remember - in addition to leaving your thoughts here, you are welcome to use my Kitchen Chat button (generously dontated by the lovely Divina!) and link back here from your own blog. Perhaps you'd like to do a post of your own? Maybe you've written about menu planning in the past? Any way you want to share, I'm all ears! First the milestone: Little Bear laughed for the very first time today! And I mean, full-on, eye-crinkling, belly-laughed! I have no idea what set him off, other than my face, lol. I had him in the Baby Bjorn and was making a cheese quesadilla for Earlybird (one handed, mind) when he just started cracking up! Oh my goodness, was he ever so cute! Now, for the menu plan ... it's very simple but at least it's a plan! Well, my friends, hope your week's off to a great start! Thanks so much for stopping by ... I'll be back here again very soon!